Just got a shiny new GPSMap 64s, woohoo, now I can give back to OpenStreetMap (thanks Trail Boss)! Oh, and not get lost and stuff. That's also a plus. Experimenting with the reception on my windowsill on a rainy Montreal day I find that the unit reports a consistently better accuracy with GPS+GLONASS compared to GPS-only. WAAS doesn't seem to make a difference. Some guy on the Internetz said that using GLONASS and WAAS reduces your battery life, but I dunno if it's significant enough to be a consideration. I have no idea if there are any ground-based stations within range of the High Peaks for it to make a difference. My phone receives both GPS and GLONASS (no control over which one it does or doesn't use). Battery life is fine even over the course of a ten-hour hike (phone has a beefy 3610 mAH capacity). My old Garmin Rino 530 HCX doesn't support GLONASS. Battery life is excellent (days) and accuracy is fine although sometimes bested by my phone. I was told using WAAS would reduce battery life. As supposedly does using the electronic compass, recording a tracklog (especially with points very close together) and using the screen with "route up" instead of north up, due to constant re-writing. The 64 is a nice model. Edit: Found this re battery life. Last edited by Neil; 09-25-2018 at 05:44 PM..
GPS + Glonass will provide you with additional satellites you can use for computing your position. With GPS you might have 8-12 in view, but add in Glonass and you might have up to 18-22 possible satellites in view. This helps a lot with shading scenarios like tree cover, or canyons/valleys. It gives you a better chance of computing your position even when you have an obstructed view of many satellites. Also, generally speaking, more satellites used in your solution = more accurate position, but not always. WAAS is just one example of a Space Based augmentation system (SBAS). You can read the wiki for more examples in Europe/India/Japan/etc. All current SBAS only provide corrections for GPS satellites, no other GNSS constellations like Glonass/Galileo. Measured performance for GPS only positioning is on the order of 4m vertical, and 2.5m horizontal 95% of the time. Using WAAS should improve your accuracy to approx 1.5m vertical and 0.8m horizontal. You probably won't notice the difference when hiking, and the receiver's estimated accuracy may not even reflect the improved accuracy (eg. it always says 10 foot). However, WAAS was built for aviation purposes, and although it does improve accuracy a good deal, its main focus is integrity. Ensuring a notification to the airplane within 6 seconds if a GPS satellite starts sending a bad signal, or there is some other source of error like space weather (ionospheric error). SBAS corrections are not the same as RTK corrections, and you do not have to be close to a base station to realize the accuracy improvements like you do for RTK. RTK will get you down to several centimeters of accuracy, but you typically have to be within ~20-30km of the base station. 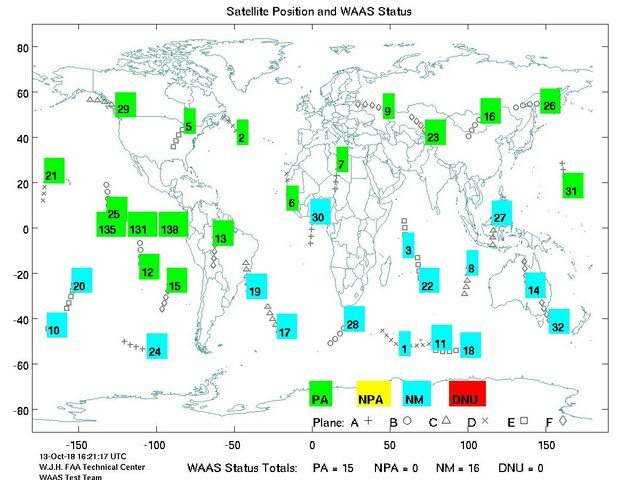 The only time distance from a WAAS base station matters is if you go far out into the ocean, outside the ionospheric correction model that WAAS provides, and that would typically only affect your vertical accuracy. The SBAS satellites that provide the correction messages are in a geo-synchronous orbit, so they will always be in the southwestern sky (in the ADKs). They can also act as additional ranging sources to aid in shading scenarios, but they will be at lower elevations in the sky (~10-30 degrees) and all in the same section of sky, so their benefit might be limited. Also, most hiking receivers capable of WAAS will only track one GEO for corrections, and will likely not utilize it for ranging. See your satellite tracking screen for details of what your receiver is doing. SBAS GEO satellite numbers are 120-158 (NMEA: 33-71). Presently, the WAAS GEOs are 131(44), 135 (48), 138(51). PRN 133 (46) coming next year. Both Glonass and WAAS will incur additional power consumption because the receiver is using energy to track and process the additional satellite signals. WAAS probably more so because you also have to process the WAAS correction messages and apply them to your measurements (additional CPU and memory usage). The power consumption has gotten much better with modern GNSS chipsets, but it will likely still be a noticeable difference. TLDR: For hiking GPS only position is fine and will utilize the least power. If tree cover or geographic shading prevents you from getting a position, then turn on Glonass. If you want maximum accuracy and assurances that GPS satellite signals are good, turn on WAAS. If RTK base stations need to be no more than 20-30 km away for proper operation, is there a similar max distance for WAAS base stations? In other words, if there's no WAAS base station within, say, 100 km of your position, is there a noticeable benefit to using WAAS? I have trouble imagining how they'd pull off the trick of ensuring the same degree of accuracy/benefit if you were 25 or 250 km from the nearest base station. Can you help me interpret the satellite numbering scheme in Locus Map? Do the satellite numbers shown in the first image (Locus Map) correspond to the ones shown in the second image (FAA Satellite Position and WAAS Status). Or is there some sort of offset required as you (I assume it was you; same moniker) described in this post. I'm trying to understand if any of these satellites are sending WAAS info and if my Android phone is using it. I see several matches (2, 5, 12, 13, 29, etc) but assume those are vanilla GPS? I believe the WAAS satellites have a higher numbering scheme? I don't know if the ones numbered in the 60's and 80's (seen in the Locus Map image) have anything to do with WAAS. By their shape I believe they're GLONASS. I know the icon's shape indicates if it's GPS, GLONASS, Beidou, or Galileo (circle, square, triangle, rhombus). Last edited by Trail Boss; 10-13-2018 at 12:55 PM.. Sorry for the delayed response, just seeing this now. WAAS corrections can be categorized as "user-position-dependent", or "user-position-independent". Corrections for error in the GPS satellite clocks and positions (ephemeris) are u.p.i, and can be utilized any where you can receive them (ie. within the footprint of any WAAS GEO-satellite, or essentially all of North America). For these types of corrections, distance from base station is not a factor. Corrections for the error caused by the ionosphere, or solar activity is u.p.d. The WAAS' model for the ionosphere can be seen in the following plot. The receiver would calculate its position, and only use the data model values immediately surrounding it. One broadcast message is the ionospheric mask, which provides the points it will send data for. Other messages contain the error estimates for those points. The ionosphere is typically the largest source of error in your position solution, and is the biggest factor to overcome in guaranteeing vertical error is bounded for safety during precision approaches of aircraft. That's one of the huge benefits of dual frequency (L1/L5), the user's receiver will be able to directly measure the ionospheric error, rather than utilizing a broadcast model. If you are outside the data model in the above plot, you would resort to a non-precision-approach (NPA) position solution, and your horizontal accuracy would drop to about 3-4 meters (from about 0.8m). In this regard distance from any base station is a factor, but indirectly in that the model is limited by the extent of the observations of the base stations. In LocusMaps, you already mentioned the shapes. This page gives a good rundown of the NMEA PRN values. It can be confusing though, because for SBAS satellites, the NMEA ID is the actual PRN minus 87. So for current WAAS GEO's (131, 135, 138) the NMEA ID's would be (44, 48, 51). None of the satellites in your pasted LocusMaps sky-plot image are WAAS satellites. The full range of SBAS PRNs was recently expanded from 120-138, to 120-158. The entire range doesn't fit in the NMEA numbering scheme anymore, so not sure how that will be reflected. This page provides documents station which PRN value belongs to which SBAS. The best app I've found for displaying tracked satellites is GPSTest. 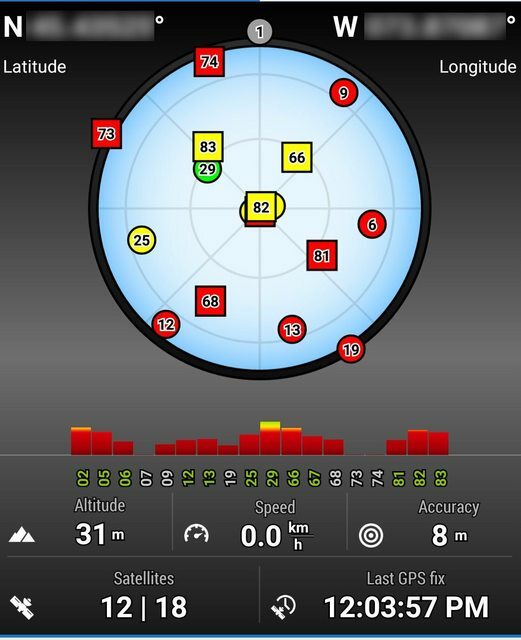 Using GPSTest on my phone, I can see GPS, Glonass, and SBAS satellites. The author of that app is a professor at University of FL, and he wrote a great article on the lack of availability of Galileo (and other) satellites on mobile devices in the US despite them having the capability to track the satellites. Hopefully this will change soon. I'll have to test on my phone if I can see SBAS satellites in LocusMaps as well. What phone are you using? Does it support SBAS? Galileo? Other? This page is a great one to discover your phone's capabilities. Quick follow-up. The GPS satellites (1-32) match on both plots you linked. 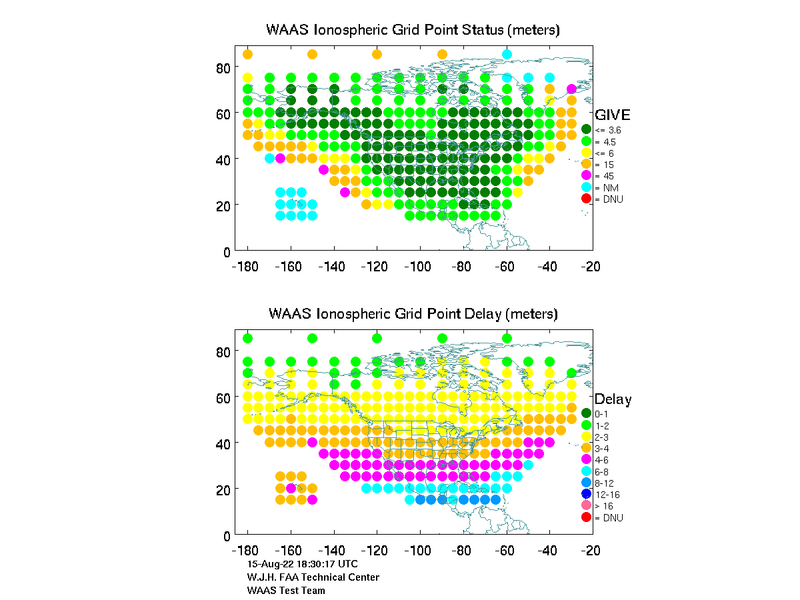 WAAS only provides corrections for GPS satellites. Many thanks for the detailed response! I must admit I'm still digesting the material because it exceeds my current grasp of the subject matter .. but I'm learning fast! FWIW, Locus Map's developer responded to my question and, long story short, doesn't believe Android currently takes advantage of WAAS (or EGNOS). I know my mid-range Android phone (Moto X Play, running V7.11) only supports NAVSTAR and GLONASS (it's 3 years old and only late-model phones, typically flagship-calibre, support Galileo). I see no Galileo icons in Locus Maps's skyplot. Satellite Based Augmentation System (SBAS) satellites not available. So, no Galileo and no WAAS for my Android phone! I'd need to upgrade to something like a Samsung S8 to get Galileo (but still no WAAS). I just upgraded from a Nexus 5x (GPS & Glonass only) to a Moto X4. The new phone uses the snapdragon 630 chipset which supports GPS, GLONASS, Beidou, Galileo, QZSS, and SBAS. In the GpsTest app on this phone I currently see GPS, Glonass, and SBAS satellites. Once the issues discussed in the Barbeau article linked in a previous post are addressed by the FCC, I should see at least Galileo sats, hopefully Beidou as well (QZSS is regional Japan only so won't see it). One thing I've noticed in my display is that there are limited values for the SBAS satellites. This could be due to several things. Either the Android API doesn't support these values for SBAS yet, or the Snapdragon chipset doesn't provide them. Barbeau claims support for it in GpsTest app, if the data is available. I'm thinking the chipset only uses them as a data stream source for SBAS corrections, and not as an additional ranging source (akin to a GPS satellite), that is why no values. Of course this can be completely different dependent on the hardware GNSS receiver in the phone. There's a massive amount of flux right now in mobile device capabilities with respect to GNSS. SBAS, dual frequency, multi-constellation just to name a few. In my opinion, documentation is very limited as well. You really have to dig to find detailed info. There's also a very large difference between mobile device GNSS chipsets, and certified aviation SBAS receivers. This page has some good details on various mobile device models and their capabilities, and discussion on duty cycling of the receivers to save battery life. Good news is, it's only going to improve. Also, while I can see SBAS satellites in the GpsTest app, they do not appear in the LocusMaps app sky-plot. Correction, although the SBAS satellites are not in LocusMaps' sky-plot, they are shown in the signal strength chart directly below the sky plot. Their PRNs are shown as 131, 135, and 138. Their omission from the sky plot may be hardware specific, or a limitation of the Android GNSS raw measurments API, as even the GpsTest app does not show the elevation and azimuth values for SBAS satellites. Another great article from Sean Barbeau, a University of Florida professor, and author of the GpsTest app. The subject is availability of dual-frequency GNSS on Android devices. That article on dual-frequency is very informative. It's a must-read!